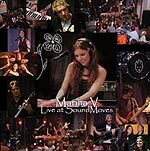 CD review: "Live at SoundMoves"
L.A.-based Marina V makes a big point of marketing herself as a Russian-born singer-songwriter. While it's understandable that an unknown musician will use every possible angle to gain attention, the strength of the songs and the virtuosic singing she displays on her latest album ought to provide her the kind of rep that lets her move beyond the gimmickry of touting her birthplace. Still, the main ingredient in all this musical goodness is Marina's voice. It is near crystalline in its tonal purity, somewhere between that of Bush and Judy Collins. As with those singers, though, it isn't just the physical beauty of the voice that seduces, but how well she uses it. Pliant and epxressive and clearly trained, Marina's singing is one of those miracles of both nature and nurture. The Beatles' "Here, There & Everywhere" is a perfect showcase for her voice, and she turns in one of the all-too-rare Beatles covers that can rival the original. Great songs, one of the most beautiful voices on the planet, looks to rival most Hollywood starlets  Marina V seems destined for fame and fortune. Get in on the ground floor.